Tender sirloin and crispy bacon swim in a garlic red wine broth with chewy pearls of barley, sweet carrots, and earthy roasted mushrooms. 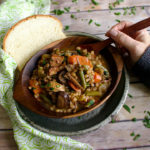 Beef and barley soup is rich and meaty enough to be called a stew, but ready to eat in just over an hour. Heat oven to 450 degrees. Cover a baking sheet with parchment paper or aluminum foil. Toss the sliced mushrooms with 1 tbsp vegetable or extra virgin olive oil. Spread out over the baking sheet and sprinkle with a generous amount of salt and pepper. Roast in preheated oven until golden brown, 10-15 minutes. Spread the pieces of sirloin out onto a paper towel. Blot the meat with another paper towel to remove excess moisture. Sprinkle with a generous amount of salt and pepper. Heat 1 tbsp oil over medium-high heat in a large, heavy bottom saucepan or dutch oven until the oil is hot and shimmering. Add the bacon and cook, stirring occasionally, until the bacon is crisp. Monitor the heat so that the bacon is browning evenly without burning. Using a slotted spoon, remove the bacon to a paper towel lined plate, leaving the rendered bacon fat in the pan, and return the saucepan to the stove. Add the sirloin to the pan and let cook over medium-high heat on one side until brown. Turn the pieces of meat over and let brown on each side. Do not overcrowd the pan – you want every piece of meat touching the bottom of the pan with a little bit of room around each piece. Brown the meat in batches if necessary. Use a slotted spoon to remove browned sirloin to a plate. Remove excess fat from the pan so that you’re left with about 1 tablespoon and return the pan to medium heat. Add the chopped onion and cook, stirring occasionally, until the onion is golden brown. In a small bowl, stir together the tomato paste, minced garlic, thyme, red wine and sugar. Add this mixture to the onion and cook stirring constantly, for 2-3 minutes. While you stir, scrape up any brown bits clinging to the bottom of the pan. Add the broth, soy sauce, barley, bay leaves, and sirloin to the pan. Raise the heat and bring the soup to a boil. Cover, lower the heat to medium-low, and let simmer, stirring occasionally, for 20 minutes. Stir in the carrots, celery, and green beans. Cover and let simmer for another 15 minutes, until the vegetables and barley are tender. Stir in the mushrooms, bacon, and chopped parsley. Taste and add more salt and pepper if desired. This soup is one of those magical ways to transform the leftovers of two dishes I make often – Slow Cooker Tri-Tip Steak and Slow Cooker Pot Roast – into a whole new, equally delicious, quick meal. If you’re using leftover beef, add it at the very end of cooking. Hulled barley or pearl barley can easily be substituted for Hull-Less Barley, but it will probably affect the cooking time a bit. Just look at the cooking instructions on the package and adjust accordingly.